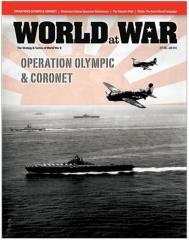 #27 "Operation Olympic & Coronet, Atlantic Wall Analysis"
Operations Olympic & Coronet is an update of the Olympic solitaire game first published in S&T along with a second complete game covering the planned follow-up invasion: Operation Coronet. The Olympic map has been updated to reflect better understanding of the tough and, in places, impassable terrain as well as the potential landing sites. The Coronet map shows the flat, wide-open Tokyo plain. The counters have also been updated with new information about the Japanese order of battle, especially their plan to move 36th Army to Kyushu as a counter- invasion force. With that, the Americans face a force intent on breaking through to the beach. Also added are: naval gunfire, atomic bombs, and even the Soviets (from a MOVES variant). The Japanese doctrine and supply rules have been updated to better reflect their historic plan for an initial counterattack. The kamikaze rules are also updated with further research into their probable effects. This Special Edition package includes two full-sized (22x34") maps of the two invasion areas and 560 counters. Both games can be played solitaire or two-player. Operations Olympic & Coronet: If the atom bomb hadn't worked to make Japan surrender in 1945, we would've had to invade their home islands of Honshu and Kyushu. This is an operation and tactical analysis of our actual plans necessary to do that.